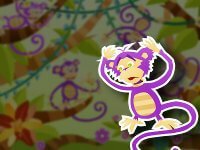 There once was a strange jungle full of boobuan monkeys. Boobuans were some monkeys with long arms and short legs, who spent all the time to adorn their arms and brightly colored bracelets. They were often visited by Mambo the macaque, carrying his cart full of bracelets and rare things. In one of his visits, appeared with incredible enormous and shiny bracelets, the most beautiful he had ever taken. And also the most expensive, because never before the price had been so high. All boobuans but the cautios Nico, ran around to get enough bananas to pay for thier bracelets. Being so expensive, they had to be the best ones. But Nico, who was keeping bananas if ever required in the future, and that often doubted whether all those bracelets serve for something, he thought they were too expensive. But as he did not want to miss the visit of Mambo, looked among its rare things for something interesting, finding a box full of strange twists irons. "They are useless, Nico," the seller told Nico, "you can keep them for a couple bananas." Thus, Mambo was having sold their bracelets, leaving boobuans happy and smiling. But soon they began to realize that applied those bracelets, so broad and elongated, left no move either arm, and was a real challenge to do what is most important thing in the life of a boobuan: taking bananas. They tried taking off the bracelets, but could not. And then it turned out that everyone wanted bananas from Nico, which were the only ones across the jungle that were not in the trees. Thus, overnight, Nico became the richest and most respected boobuan in the jungle. But there was not the thing. That box of rare twisted irons Nico found as interesting and cheap, proved to be a toolbox, and when Nico discovered its many utilities, not only was able to release other bubuans of those stupid bracelets, but they found plenty of ways to use them to achieve amazing things. And that was how, thanks to the wisdom of Nico, boobuans realized that the price of things has nothing to do with its actual value, and that getting carried away by the fads and other messages of the sellers is a sure way to end up with problems. People are able to do weird things to dress like everyone else or to have a popular toy. Have this ever happen to you? What do you think they would say about Nico for being the only one who did not buy the bracelets? Talk often with your child about money to let her understand that expensive things can be of low value, and cheap ones can ve very valuable. Use specific examples of things you value well above its price.